As I mentioned two weeks ago, I've been meaning to head up to Mt. 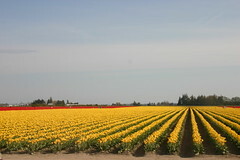 Vernon with my wife and daughter to partake in this year's Skagit Valley Tulip Festival. We finally got our chance today. We got off to a late start, but that was okay since it gave me a chance to catch up on some of the goings-on with the Seahawks and the draft before we left. We ended up leaving our place around 1:30pm, and after a brief stop at the store we were heading north and enjoying the fact that the sun was shining. Traffic was decent until we got up around Mt. Vernon. At that point, things pretty much slowed to a crawl. Unfortunately, that was around the same point Heidi grew tired of being confined to her car seat. After deciding to bypass the northbound exit to the city center, we came back down from the north and had a little more luck actually getting off the freeway. At that point, though, Heidi was at wit's end (which means her parents were, too), so we pulled into a parking lot and carried her around for a bit. It just so happened we were in the shadow of that big smokestack that has the tulips painted on it (an image that has been with me since childhood). Once we had calmed Heidi down a bit, we got back in our car and made our way toward the tulip fields. Unfortunately, I accidentally took a wrong turn at a fork in the road and ended up on a highway heading back east toward I-5. Since it was about 5 o'clock at that point, all eastbound roads were a mess, since a whole lot of people had already gotten their fair share of tulips and were heading back toward the freeway to go home. Eventually I was able to turn off and then head back in the other direction. When we got close to the tulip field I had originally missed, traffic yet again slowed to a crawl. When we finally reached the field, there was a cop standing at the entrance of the parking area, telling passers by to continue on. According to him, the parking lot was full. I tried to park on the side of the road, and he came over and knocked on my window, motioning to me that I couldn't park there. As I drove further away from the parking lot entrance, I noticed several open spots. Needless to say I was frustrated. Heidi was still crying in the backseat, and if it wasn't for her sunglasses, I probably would have seen a tear or two welling up in my wife's eyes as well. I turned around again, snapped a photo from my window (seen here), and then took a turn down a different eastbound road that I hoped would lead us to another tulip field. Sure enough, it did. As we got closer to the field, I could tell that it actually had more colors to offer. I also noticed a bunch of cars parked in a field, probably illegally, but parked nonetheless. My gut told me to keep driving (if you could call the speed at which we were moving driving) and to just park in the "official" $4 parking lot. To my indescribable dismay, as I finally reached the entrance to the official lot, a man stood in the center of the path with a sign reading "Parking Lot Full." I seriously could not believe my eyes. A quick tweet was not enough to subdue my frustration. I managed to take one more photo of the tulips from my car window before driving back toward the freeway. All the while, I couldn't help but feel angry that a city with such an obvious interest in bringing in tourists could fail so mightily in satisfying said tourists. Really? You're going to let me drive for hours, devoting at least half my day to visiting your city and your admittedly beautiful tulip fields, and then absolutely fail in providing a place for me to park my vehicle so I can actually get out and see the fields up close? Really!? I sincerely hope that we were only one family in a minority that didn't get to actually park, get out and enjoy the tulips. Having been able to get out and walk around in the past, I can attest to what we missed out on today, and I really hope people who hadn't yet gotten to experience them didn't get turned away similarly. However, based on everything I could tell, even at what I would assume is an off-peak hour in the late afternoon, many people were being turned away. Worse yet, they were being turned away after having sat in unbearable traffic through a city that is not designed to support the sheer number of people they are bringing in each year.